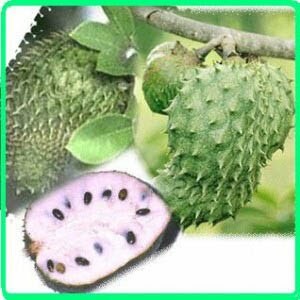 Graviola is a fruit-bearing tree found mostly in rainforests and is also known as soursop and paw paw. The tree grows to about six meters high and has dark green leaves. Graviola fruits are yellow-green in color and are about 20cm in diameter. The white fleshes of the fruits are edible and are often made as desserts and drinks. Researches of graviola's healing properties date back in the 1970s. Results of the initial studies have yielded that graviola possess phytochemcials which are substances that aids in strengthening the immune system and other body functions. Later experiments revealed that extracts of graviola stems can eliminate cancer cells, both benign and malignant. These discoveries lead to further studies on other parts of the tree. Annonaceous acetogenins found in the stem, bark, fruit seeds and leaves of graviola can be used to both cure and prevent cancer. Food that can help prevent fatal diseases like cancer are rare. Cancer patients gain double benefits in graviola treatment. Aside from being cured, they risk for getting inflicted by cancer in the future will be lessened. People infected with cancer once - though successfully healed - are more susceptible to acquiring another or the same type of cancer. Graviola acetogenins are powerful cytotoxins and anti-carcinogens which mean they can limit abnormal cell mutation and eliminate cancer cells. Graviola herbal treatment has been endorsed to prostate, pancreatic and lung cancer patients. Annonaceous acetogenins function by inhibiting the production of ATP and NADH. Excess activity of these nucleotides often leads to cancer and even drug resistance to medicine. Acetogenin bullatacin in particular works to stop the production of ATP. ATP or Adenosine triphosphate transports the energy needed by the different organs through the cells. Rapid ATP movement also causes rapid movement of the cells and may cause internal damage or escalated growth of cancer tumor. For patients under cancer medication, disturbance in the metabolism and other cells functions may lead the body to develop allergic reactions such as resistance to the medicines. There is an accepted treatment for cancer called the ATP Depletion Therapy which has two kinds - Electromagnetic and Biochemical. The latter of the two uses organic medication which involves dietary supplements and herbal medicines such as graviola. Meanwhile, NADH or Nicotinamide adenine dinucleotide is responsible for redox reactions in the body. Just like in ATP, fast transfer of electrons through the NADH can cause rapid cell division and untoward mutation. However, some studies have also stated that NADH can actually help in repairing impaired tissues. Apart from being a cure for cancer, graviola can also be used to treat other diseases such as flu, cough and colds, inflammations and cardiovascular illnesses. Externally, extracts or decoctions of graviola leaves can be applied to treat neuralgia, rheumatism, and arthritis. Others also say that spreading crushed graviola leaves can also aid in correcting abnormal sleep habits such as insomnia. There are different types of supplements sold in the market containing graviola acetogenins. But though graviola has already been certified as an effective treatment and preventive aid for cancer, remember that its curative properties will not work if not coupled with a healthy lifestyle. For more information about Preventing Cancer with Graviola please visit our site http://www.howcurecancer.com.